When planning a tropical holiday in India, the first name to pop up in our mind is the amazing seaside retreat, Goa. However, it isn’t the only beach area in India. Don’t forget, the country hugs a coastline of around 4600 miles and it is 11 states that land across the area. There are several other beaches that are worth your visit. Each shoreline brings its special experience to the tourists, some offer family-friendly water activities and some open up to moon-style parties and best diving in the blue waters. We have brought together the best beaches in India combed a list you ought to mark sooner or later in your travel diary. If Andaman Islands couldn’t be possible any sooner, head towards the Tarkarli Beach in South of Maharashtra. This beach is known to house few of the best coral reefs to be seen on Indian mainland. As there’s no strong trace of development seen in the area, the beach is not amongst the most popular tourist getaways and gives a village feel of peace and serenity in the homestay accommodations. However, if you want to experience the beautiful tropical region of the country, it’s a good option for sure. Have a meeting in Mumbai? You can book your business class flights to Mumbai and spare an extra day for the beautiful beach after the business meet. Gokarna is a town in Karnataka, located 190km south of Goa and offers an amazing break from the otherwise fast pace of Goa beaches. Majorly known for the famous Mahabaleshwar Temple and beautiful clear beaches, you can bask in the sun or read your favorite book by the shore without any interference. The place is a perfect blend of spirituality and beach fun. Some of the most popular beaches in Gokarna are the Half-Moon Beach, Paradise Beach and Om Beach. Whatever it may be, we just can’t skip Goa off the list of beaches in India. It has some of the most visited beaches of the country and Palolem is one in the long list. A beach as picturesque as Palolem is hard to find, surrounded by thick green forests of coconut palms, the beach lies in the Southern Goa. It is almost a mile long, quite shady and semi-circle in shape. It attracts a diverse crowd from all over the world which shows the level of popularity the beach has attained over time. The Eastern cost of India is also home to some of the popular beaches, one of them is Puri Beach in Odisha. Puri receives thousands of pilgrims and tourists with an intention to pay homage to the Hindu deity Lord Jagannath. Not just the temple, but the main beach is an important attraction in the town. The wonderful beach lies on crystal white sands with the clear waters of the Bay of Bengal which makes it one of the most loved beaches in India among tourists from across the globe. When in Puri, do not forget to get the mouth-watering taste of fresh catch of sea food – pamphlets, prawns and mnay other varieties of fishes. Another popular beach on the Eastern coast is the virgin beach of India, Mandarmani, situated on a distance of four hours to south of Kolkata (by road). Earlier known to be a sleepy fishing village, Mandarmani is gaining unparallel popularity with the fast-development of turning it into a resort town for tourists, both Indian and foreigners. It is almost an 8-mile long shoreline of sand occupied by red crabs. There are a couple of beaches around the area, Digha and Shankarpur, popular for their awe-striking sunrises and placid waters. Having sudden plans? Book your last minute flights to Kolkata right away. Kovalam Beach in Kerela is one of the best Indian beaches that receives innumerable tourists every year. Located 16kms from Trivandrum, it is a popular beach destination in India attracting diverse crowd. Being a commercially valued beach in the state, life never takes a halt here and you will love it for the enthralling water activities Kovalam offers. Often considered as Asia’s best beaches, Radhanagar Beach is situated on the Havelock Island of the remote area Andaman and Nicobar Islands, a region between India and Thailand. The isolated coastline serves as a land of fine sand and calm waters for the travelers seeking a peaceful ambiance. You can indulge in some exciting water sports such as surfing, sailing, fishing, kayaking and even treks. If you are not an adventure freak, a soothing sunbath will make your day. Located in the Southern end of Karnataka, Kaup is a perfect retreat to the backwaters of River Netravati. It is one of the amazing beaches in India with blue waters, enclosed by the groves of Casuarina trees. Travelers get to see a spectacular sunset from top the lighthouse, almost century-old. When done with the calming walk and adventurous banana boat rides, head towards the St. Mary’s Islands. It is believed that Vasco da Gama, the Portugese explorer, landed here around the 1490s while moving towards Kerela. Lakshadweep is home to stunning tropical beauty and isolated sands. The magnificent beaches in the archipelago provide access to private coves and several water sports. But as a change, Minicoy is one of the best beaches around India that brings absolute seclusion for the seeking travelers. You can enjoy diving or snorkeling amidst the coral reefs. If you want a tour to the backwaters of Kerela, Marari beach is the best pick in the God’s own country. Located almost 60kms from Kochi, the beach offers the mush required tranquil and picturesque atmosphere to the travelers to retire and relax. You should visit this beautiful beach destination in India at last once in your lifetime. India has some of the best beaches of the world enclosed by the Bay of Bengal, Indian Ocean and Arabian Sea. 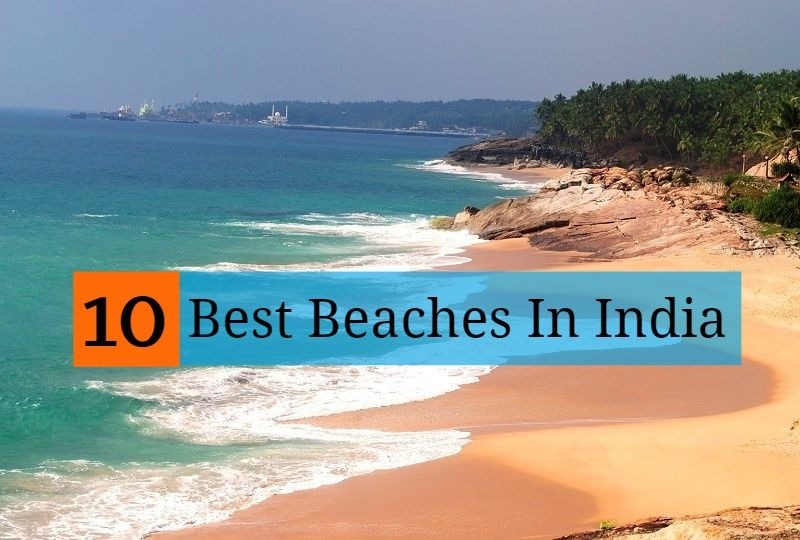 If you are an ardent beach-lover, make sure you tick off all the names of the best beaches in India discussed above.